HealthAlliance’s Family Birth Place combines a family-centered environment with the highest standard of medical excellence and aids a newborn during birth. Last February 8 dawned cold and drizzly in Heather Blaikie’s hometown of Millbrook. 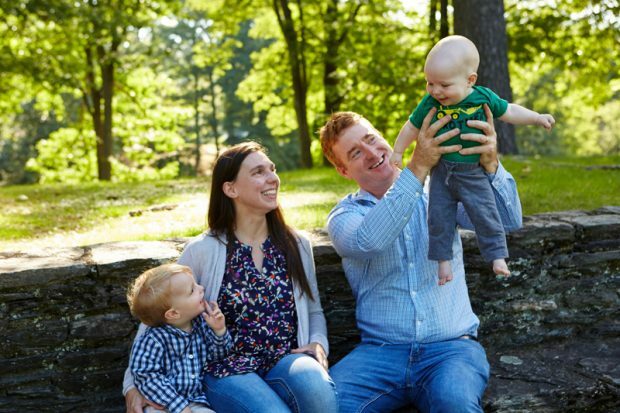 Blaikie, 37, a park planner and mom of a 2-year-old son, was past her January 29 due date for the birth of her second child with husband Timothy Lynch. For the past few weeks, she had experienced several false starts with her labor, so when her contractions started that morning, she thought they might be more of the same. But when they began coming 10 minutes apart, Blaikie’s midwife advised her to go to the Family Birth Place, where she planned to deliver. Located on the fourth floor of HealthAlliance Hospital: Broadway Campus, a member of the Westchester Medical Center Health Network (WMCHealth), in Kingston, the Family Birth Place was opened in June 2009, when HealthAlliance was formed. Since then, it has hosted nearly 4,000 deliveries. Dedicated to providing the highest level of care to expectant women, it offers a range of choices in a secure and family-friendly environment. “Its establishment is in keeping with the trend to have more family-centered birth environments, as opposed to the traditional model, where you deliver in one room and move to another,” says Robin Stevens, MSN, a registered nurse certified in inpatient obsterics, as well as a certified diabetes educator and director of the Family Birth Place. “We follow the LDRP (Labor, Delivery, Recovery and Postpartum) protocol, in which the mom undergoes labor, delivery, recovery and postpartum in one room, with one nurse caring for her throughout, for greater consistency.” HealthAlliance Hospital’s eight spacious LDRP rooms and three private antepartum/postpartum rooms look more like they belong in a hotel than a hospital, with flat-screen TVs, wood-look floors, high-tech medical equipment camouflaged by cabinetry, wooden beds and rockers, and lounge chairs that convert to sleepers. There is also a family lounge, dining room and open kitchen with a refrigerator stocked with juices and snacks, and new parents are treated to a celebratory gourmet dinner. The Family Birth Place is staffed with doctors, midwives, nurses and obstetrical technicians; many are certified lactation consultants. The first hospital in the area to be certified Baby-Friendly — meaning it offers an optimal level of care for infant feeding and mother-baby bonding — all births are “rooming in,” where the baby stays with the mother with minimum separation, to encourage bonding and breastfeeding. The facility also encourages a skin-to-skin protocol, in which the newborn is placed on the mother’s chest right after birth, supporting optimal mother-baby bonding. In addition to offering childbirth and breastfeeding classes, the Family Birth Place provides such proven methods of low-intervention labor management as birthing balls to coax the baby into an optimal position, a hydrotherapy tub and nitrous oxide. On that particular morning, there wasn’t much time to enjoy the view. “They told us because he was a big baby, specifically the size of his head, this was not going to be a regular birth,” says Lynch. Indeed, Blaikie experienced a rare childbirth complication. One of her son’s shoulders became lodged at a joint at the pubic bone, so only his head had emerged. Called shoulder dystocia, it occurs in only 0.2 percent to 3 percent of vaginal births. Fortunately, the medical team successfully delivered David, who weighed 9 pounds 7 ounces, at around 7 p.m. that evening. Thanks to the team at the Family Birth Place, David is now a happy and healthy 9-month-old. Blaikie is grateful for how well the staff took care of her and her newborn. “Even though there were other things happening on the floor and other babies being born,” she says, “I felt like I was the only patient. It was very individual and caring.” Best of all, today David is a happy, healthy and active baby, busy grabbing at everything, she adds. At What Age Do We Peak?